The West Maple Road and Graske Crossing access sites to the Elkhorn River are closed due to high water levels. The Elkhorn Crossing access site is closed for the season (including the campground) for renovation due to extensive water damage. High river flows occasionally force the NRD to temporarily close our river access areas. Park closures for Elkhorn River sites are called for when the Elkhorn River gauge at Waterloo reads a stage of 5 feet or greater. Also, river access ramps may need to be cleaned of silt, debris and safety inspected before reopening. Elkhorn Crossing Recreation Area is located just east of the intersection of 252nd and Bennington Rd. in Douglas County. The public-access site features a boat ramp, improved camping facilities, new RV pads (no electrical hookups), small playground, new hand-pump well, and new restrooms. For safety and environmental reasons, the park is glass free. The revitalized park provides a large-group camping location for local youth, families, river float trip enthusiasts and others. Primitive camping is allowed at Elkhorn Crossing Recreation Area on a limited 7-day stay basis and a $10.00 per day camping fee. Camping is not available at many other river-access parks in this area. The boat ramp will be used by many as a put-in location for float trips to the NRDs other river access sites at W. Maple Rd and Graske Crossing near W. Dodge Rd. These three sites facilitate short to moderate river float trips for tubers, canoeists, and kayakers. These activities have blossomed in our metro area due to the NRDs construction of river launch and landing areas. 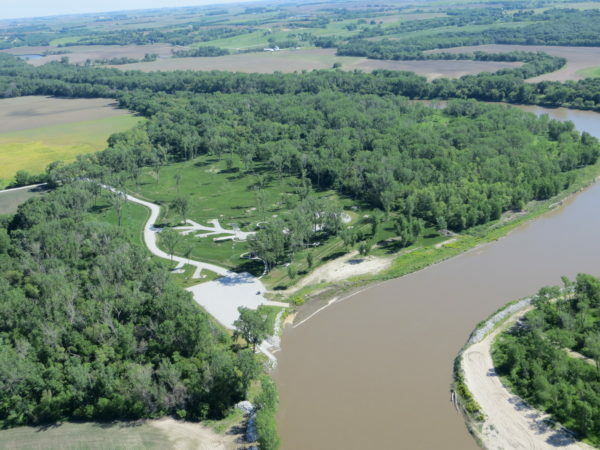 The rustic, 27-acre Elkhorn Crossing park is managed by the Papio-Missouri River Natural Resources District and was constructed in 1989 as part of a major riverbank stabilization project by the NRD and the Nebraska Natural Resources Commission. Thousands of immigrants, bound for the west, camped near this area waiting to cross the river. Even with Elkhorn Crossing in place, public access to both the Elkhorn and Platte Rivers was lacking. 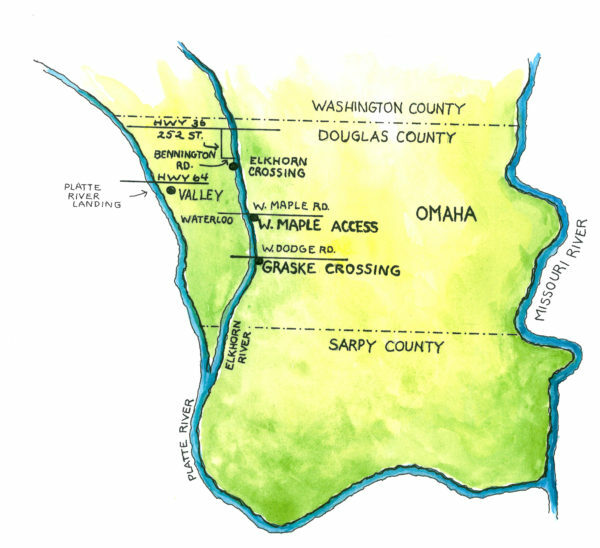 A Papio-Missouri River NRD plan to construct access points for canoeing, tubing or rafting on the scenic Elkhorn River began in 2006 with the completion of a site near the West Maple Rd. across from the Village of Waterloo. The NRD maintains this area that features canoe launching and landing, picnicking, restrooms and parking. The land was donated by the Robinson family. Graske Crossing, our newest access area, opened in the fall of 2008 and is near W. Dodge Rd. This area is about a two-hour float trip from the site at Waterloo. Land for this project was donated to the NRD by the G & G Manufacturing Company, owned by the Graske family. It also features canoe launching and landing, parking, picnicking and restrooms. Both Graske Crossing and the West Maple Rd. site are open from April 1st through November 1st 6:00 a.m. thru 10:00 p.m. Located near Highway 64 on the Platte River, Platte River Landing is a 10-acre site offering public access to the Platte River. This facility opened in 1992 and was constructed in conjunction with the Union Dike Flood Control Project. 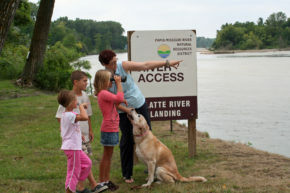 Platte River Landing offers a concrete boat ramp, fishing access trail, picnic tables, playground, grills, gravel parking lot and vault toilets. It is an estimated 1/2 day canoe trip to Two Rivers, or a full day trip to Louisville State Recreation Area. Open 6 a.m. to 10p.m. Closed for winter Nov. 1 through April 1. Permits for special use may be granted by the NRD.